But, it can also be quite stressful, as we all know. I know personally, because I got injured! While not the end of the world, injuries can be very stressful, both mentally and physically. Just know that injuries are, periodically, a real part of leading an authentic, athletic life. Just sequestering yourself and perpetually “being careful” about your body is a fast track to the nursing home- our bodies expect, and need to be stressed, and to do hard things at the very edge of our abilities! In my case, I just overworked. This is the same as overtraining, which I have seen time and again- someone gets good results with strength training, and thinks “Hey- if I just do even more I’ll be awesome!” Well, then they wind up with black and blue bruises on their triceps, or wherever, and become weaker, not stronger than before- and also injured in many cases, which is even worse. But, when I get caught up in physical work, well, I get too caught up and forget. I just want to get the job completed! And so, when I painted my barn of a garage, I just kept going, and going, and going! Then, I wanted to construct a playhouse for my grandson, and kept working on it, in very confined spaces, with a big power drill that contorted my body (and shoulders) into uncomfortable angles. These two activities took up 4 whole days, on which of course I did my workouts before starting work! My right shoulder was fried! Dark bruises formed around the perimeter, and I could not really lift my right arm above my head. Me! PaleoJay, exercise nut and functional fitness espouser- victim of my own cautionary tales. Ah, such is humility. It happens. We are all only all too human, and afterwards we need to get up and start to repair the damage. And, it is a learning experience: I learned about DMSO, which is Dimethyl sulfoxide. You can get it in a cream form, or liquid, and I have been rubbing the cream on my shoulder a couple of times per day. It is anti-inflammatory, and enhances circulation dramatically- in addition, it relieves pain really quickly as well. DMSO has been used by veterinarians and horse race trainers for decades, along with some enlightened medical practitioners. I plan to continue to use it, and explore its possibilities. Of course, the FDA disapproves, as they disapprove of anything that can’t be patented by drug companies for huge profit potential. DMSO has been known of for so long, that no one can claim the patent. In addition to that? Train cautiously. For a few days, all I did was to stretch out in the mornings. Also, I did do isometric full body holds for multiple reps, with my arms at my sides… Then, I added in straight legged setups and hindu squats for multiple sets, since they did not aggravate my upper body. My shoulder mobility improved dramatically, and this morning, about a week later, I did some pushups and other exercises using my gymnastic rings in the basement! Hallelujah!! 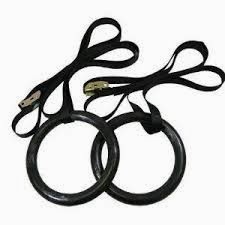 If you do not yet have rings in your house or garage, consider getting them- the most useful apparatus for training ever. I was doing pushups in the almost standing position, and flies as well- no strain. Went back and lower, still fine- I just made sure to not go into the “pain zone”. I could do pistol squats as well, no problem, and even chins on the rings, with leg support. The one thing I can’t do yet is isometrics with arm-against-arm resistance. But it will come, and soon- you just need to listen to your body, and not give up! Being careful about training is not the same as being careful by doing nothing!